Put the peanuts on a baking tray and put in the oven to roast. Nuts burn very easily so be careful, you just want them slightly toasted (3-5 mins). You can do this in a frying pan too. Once slightly cooled but into a blender with the honey / maple syrup and a pinch of salt. Pulse a few times so that they are chopped up. Leave to one side. Pre-heat the oven to 180c. Lay the bacon out on a wire rack on top of a baking tray. Sprinkle with a little brown sugar and drizzle with honey. Put in the oven for 10-15 minutes until crispy and caramelised. Heat a small pan, add a drop of oil. Add the chopped white onion and the garlic. Take off the heat when it has become translucent – 4-5 minutes. Put all of the patty ingredients in a bowl and mix together. Divide the mixture into four and shape into patties. Push your thumb down half way in the centre of each patty so that they don’t dome when they are fried. Heat a frying pan with a little bit of sunflower oil so that the patties don’t stick. Fry the patties on each side for 4-6 minutes. Mix all of the aioli ingredients together in a small bowl and set aside. While the patties are frying, slice your buns in half and toast them in the toaster or in the oven. When the patties are almost cooked lay sliced cheddar on top of them in the pan so that the cheese melts. Build your burger – Butter your bun and slather with the aioli. 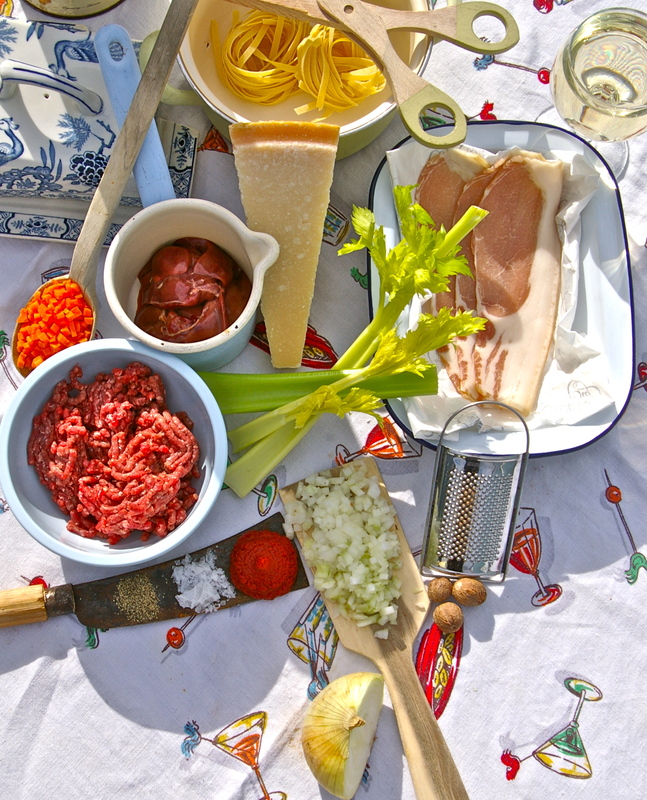 Start at the bottom with salad, the patty, melted cheese, caramelised bacon, red onion, tomato etc …. keep on building. This serves 3-4. Serve with rice. Put the mussels in a pot and pour over a kettle of boiling water so that the shells open. Drain the water and remove the flesh from each shell. Throw away any that don’t open. Make sure you remove the beard off each mussel. Mix together the garlic, turmeric, salt, chilli powder and vinegar and marinate the mussels in this paste for 15-30 minutes. Fry the mussels on a medium heat for 10-15 minutes in a tablespoon of coconut oil. In a separate pan (i used a wok) heat 3-4 tbsp of coconut oil. When it’s hot add the curry leaves and mustard seeds. After a few minutes add the onions and ginger and fry until the onion is translucent and starting to soften. Add the tomatoes and green chillies. Cook for a few minutes. Add the cooked mussels (including any of the marinade) into the onion pan. Stir together on a medium-high heat. Add the ground coriander and garam masala. Add half a cup of water and then simmer for 10-15 minutes. Add some salt if necessary. For a dry fry, cook until the liquid has evaporated. Finish with a sprinkling of curry leaves. by Crescentia and Chris Fernandes who own Bernardo’s Goan Restaurant in Gurgaon, Delhi. The pork used must be fatty, Wash well and drain the pieces of pork. Add two handfuls of sea salt. Mix it well in a plastic or wooden colander (not metal). Put a plate to cover the meat and put a weight on top so that all the liquid drains out below. In a blender make the masala. Put chillies, cumin, cinnamon, pepper, cloves, turmeric (which helps to preserve it), and ginger garlic paste into the blender. Add the vinegar to make a smooth spice paste. Add salt petre to the pork and mix well. Pour over the spice paste and mix well. Fill the sausage casings with the pork mix using a funnel and a cutlery knife to push the meat down. Tie the casings at the end. 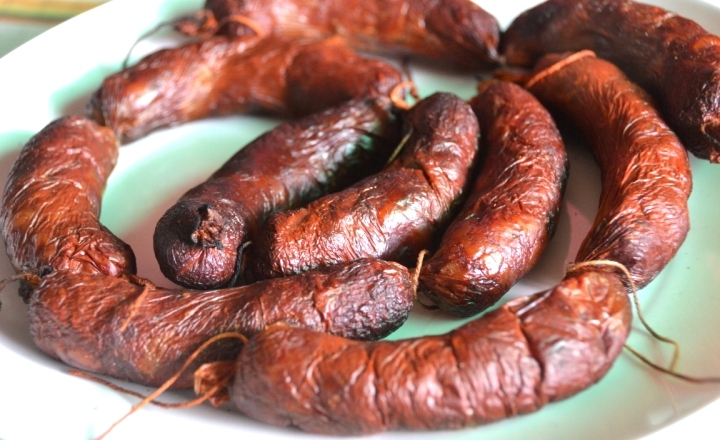 Two days later – smoke the sausages. Light a pile of damp leaves and grass on fire outside. Hang the sausages above so that they are consumed by the smoke coming from the leaves. You can cover the sausages so that they are properly smoked. Sun dry the sausages on a washing line in the hot Indian sun for a day. They are now ready to be cooked. Fry without oil, the sausage will release its own red delicious oil that will flavour ingredients added to the pan or soak into large chunks of white bread. 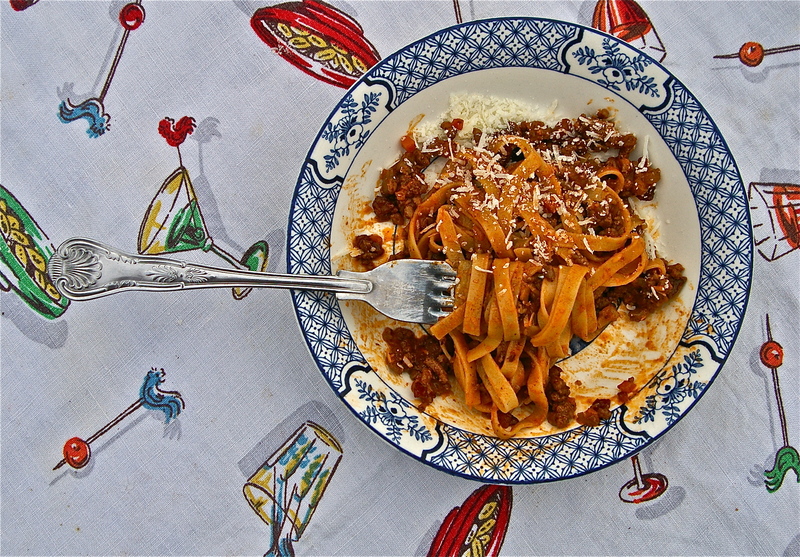 This is in the true name of the Bolognese sauce which, in one form or another, has travelled round the world. In Bologna it is served mainly with lasagne verdi, but it can go with many other kinds of pasta. The ingredients to make enough sauce for four generous helpings. Cut the bacon or ham into very small pieces and brown them gently in a small saucepan in about ½oz [15g] of butter. Add the onion, the carrot, and the celery, all finely chopped. When they have browned, put in the raw minced beef, and then turn it over and over so that it all browns evenly. Now add the chopped chicken livers, and after 2 or 3 minutes the tomato purée, and then the white wine. Season with salt (having regard to the saltiness of the ham or bacon), pepper, and a scraping of nutmeg, and add the meat stock or water. Cover the pan and simmer the sauce very gently for 30-40 minutes. (However i actually then removed the lid and simmered for an hour at least to reduce the sauce). 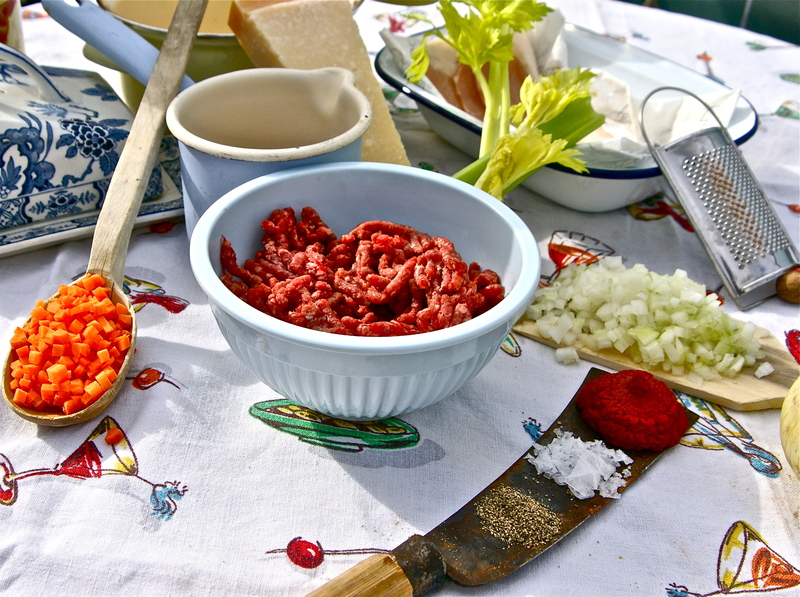 Some Bolognese cooks add at the last 1 cupful of cream or milk to the sauce, which makes it smoother. When the ragu is to be served with spaghetti or tagliatelle, mix it with the hot pasta in a heated dish so that the pasta is thoroughly impregnated with the sauce, and add a good piece of butter before serving. Hand the grated cheese separately. 245g plain flour, pinch of salt, 115g chilled butter, 25g finely grated parmesan, 2 tablespoons chopped thyme, 2 egg yolks and 3 tablespoons of cold water mixed together. Sift the flour and salt into the bowl of the magi mix, add the parmesan and thyme. Cut the chilled butter into cubes. Add the butter to the four. Pulse the magi mix until the butter and flour resembles breadcrumbs. Add a tablespoon of the liquid mix to the breadcrumb mixture and start the magi mix. Slowly add a few tablespoons of the liquid mix at at time until the dough comes together as a whole. Tip the pastry on to cling film, wrap and put in the fridge for half an hour. Roll out your pastry and line a 24cm flan ring. Chill the lined pastry case in the fridge until very firm. 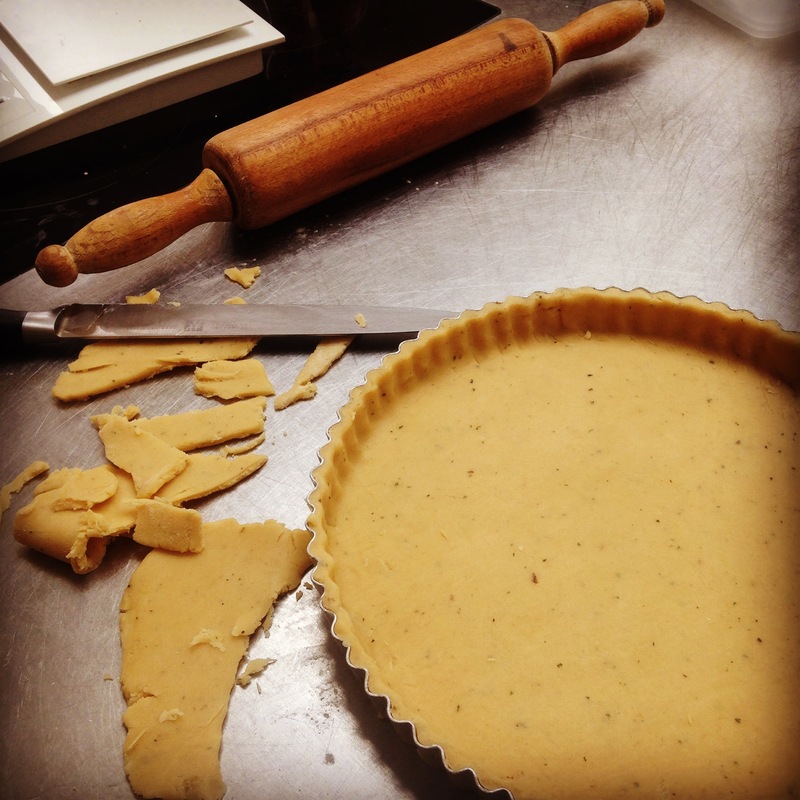 Heat the oven to 200c and blind bake the pastry with a cartouche and baking beans for 20 minutes. Then remove the cartouche and baking beans and bake for a further 10 minutes. Reduce the temperature of the oven to 150c. 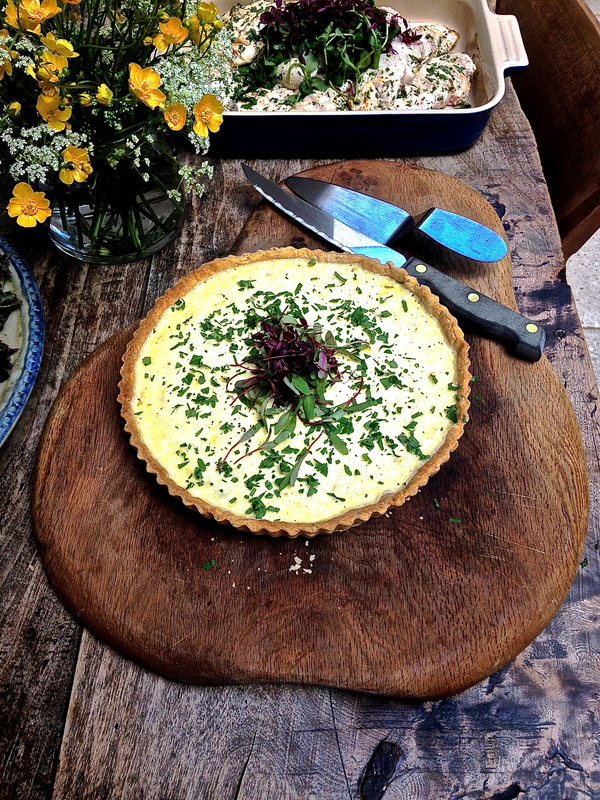 2 small leeks finely sliced, 2 tablespoons each of finely chopped marjoram and parsley, 30g butter, 100g finely grated gruyere cheese, 3 eggs, 350ml double cream. Melt the butter in a small pan. Wash the leeks then cook in the melted butter with a wet cartouche until soft. Drain the leeks. Mix the eggs and cream together well with a fork and then sieve. Add the leeks, herbs and cheese. Taste and season with salt and pepper. Pour the mixture into your blind baked pastry case. Bake on the bottom shelf of the oven for 45 minutes. It is done when there is still a small wobble in the centre but no liquid remains. Garnish with red amaranth, chopped parsley and freshly ground black pepper. Firstly, peel the pears (one per person), leaving the stalks on. Then put them in a large cooking pot, lay each one flat on one side and pour in your prize bottle of mead. You want the liquid to come half way up the pears. If it needs topping up do so with water. Add a few bay leaves and a few tablespoons of honey and simmer on a low heat. You can also add a stick of cinnamon and a couple of star anise if you want to spice it up a bit. After 30/45 mins feel the side of the pear that has been submerged in the mead. It is soft to the touch turn the pears over and cook them on the other side for the same amount of time. 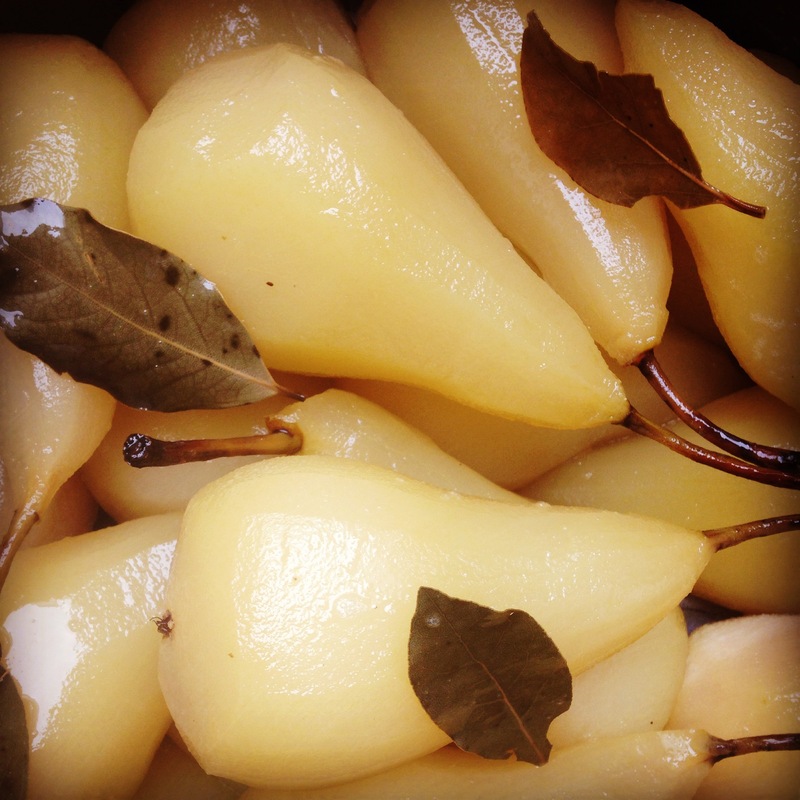 Once the pears are soft through remove them onto a dish and keep warm. Return the liquid to the heat and reduce until syrupy. Clearly, in the 80’s you had to actually be a good cook to be able to pull something like this off as being able to prepare a well flavoured consomme with no direction isn’t easy. 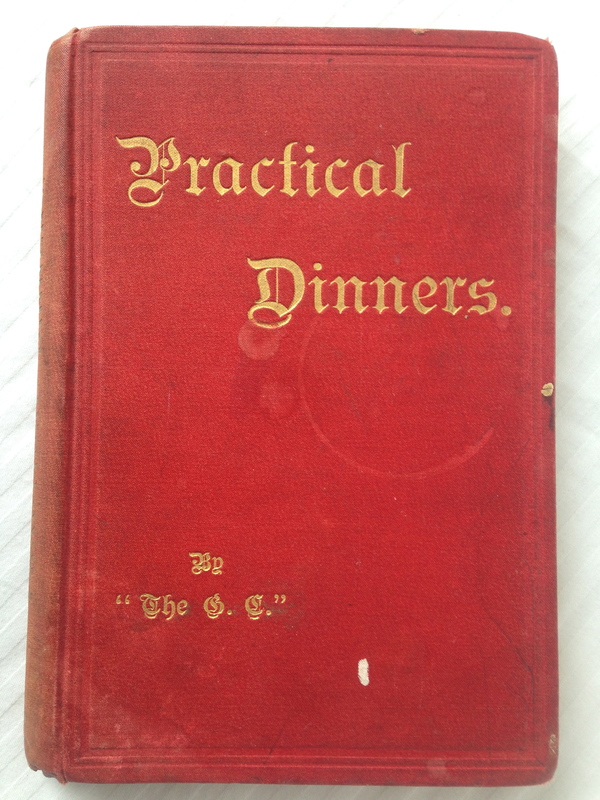 Therefore it is very different in comparison to cookery books today which tell you every last detail! I guess the clue for the format of this recipe book is in the title. ‘Dip the veal cutlets in liquefied butter then roll them in equal parts of parmesan cheese and breadcrumbs, and pepper and salt to taste. When the bread crumbing is quite set, dip the cutlets in egg, and again cover them in parmesan cheese and breadcrumbs. Let them stand for a couple of hours, then fry them a light colour in butter. Boil a small quantity of macaroni in the usual way, dress it with some butter and plenty of tomato sauce into which the yolk of an egg has been stirred and sprinkle it freely with parmesan cheese. Lay the macaroni on the middle of the dish, the cutlets round and serve’. Carrot Soup, Soles with White Sauce, Veal Cutlets with Macaroni, Roast Quails, Green Peas, Cheese Biscuits, Watercress Butter, Breadcrumb Pudding and Cream Tartlets. I believe these breadcrumbed veal cutlets served with macaroni is the British take on the Italian dish Veal Milanese which is a flattened breadcrumbed veal fillet served with tomato spaghetti.